We're making it darker and cranking up the excitement with special effects lighting. It adds an extra thrill to our inflatable rides and games, and kids love the glow-in-the-dark accessories. Younger kids will also love the experience if they're not afraid of the dark. The sessions include music, games, and, of course, play time on our giant inflatable toys. Bouncing in Bounce Stadiums with glow necklace under our black lights and disco lights synchronized to the music. * BounceU Orange reserves the right to change, modify or cancel any events or activities at anytime without prior notice. Sorry - Open Bounce Bookmarks or Passes are not accepted for this event. You don't need a special occasion to get your bounce on. Give us a call and reserve your spot at our next All-Ages Open Bounce, then come on by and enjoy our awesome inflatables, fantastic games, and wall-to-wall fun. The sessions include music, games, and, of course, play time on our giant inflatable toys. Parents must stay on the premises with their children and are welcome to join in the fun. All participants under age of 18 must be accompanied by an adult. Children must be able to walk to play on the equipment. * BounceU Orange reserves the right to change, modify or cancel any events or activities at anytime without prior notice. Younger children just can't get enough bouncing, and Preschool Playdate gives them a chance to come back every week. Nothing could be better than having a chance to laugh, socialize, and get a little exercise, and our experienced staff is on hand to supervise at all times. As long as they're old enough to walk, they'll enjoy our music, our games, and all the bouncing they can handle. This event is for children of ages 7 and under. Parents must stay on the premises with their children. 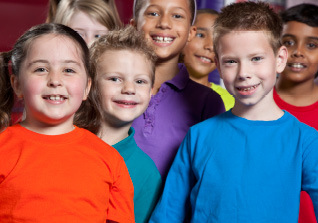 *BounceU Orange reserves the right to change, modify or cancel Open Bounce activities at any time and without prior notice. Special booking for your Home School Group is available !! 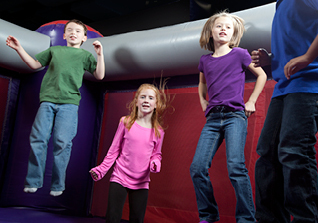 Calling all homeschoolers - you don't need a special occasion to get your bounce on. You bring the socks, and we'll take care of music, games, fun and everything else !! What other best ways to have the homeschoolers social with each other and exercise at the same time? 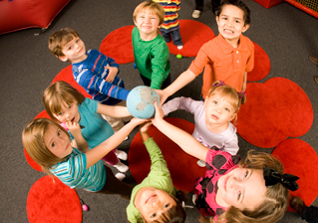 BounceU Orange offers the best Home School Bounce in the local community. Homeschoolers can join the regular Preschool Playdate or Open Bounce sessions depending upon the ages of the homeschoolers, or we can customize a private Home School Bounce session for your group so the kids can have the best homeschooling experience ever !! 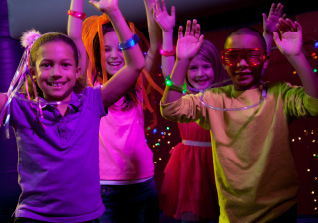 Food Bundle or Cosmic Bounce package can be added to complete your Home School Bounce experience. Call us at (714) 744-5867 for more information. Special booking for your Moms' Group is available !! BounceU Orange welcomes all Moms' Groups. We know how hard it is for today's Moms - kids, family, friends and work. Only at BounceU Orange, our glorious bounce stadiums provide the best environment where Moms can relax and have a little time of their own while our experienced staff supervising kids at all time to make sure everyone is having the best fun and exercise in the safest way. 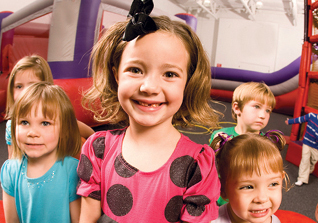 Moms' Group can join the regular Preschool Playdate or Open Bounce sessions depending upon the ages of the children, or we can customize a private Moms' Group Bounce session specifically for your group so kids, and Moms, can have the best experience ever.